Hey yall, happy meal prep Monday! As promised, I'm sharing my cauliflower wings recipe with you guys. After tons and tons of requests on Instagram to share, I knew I needed to get this recipe out to you guys quick, fast and in a hurry. 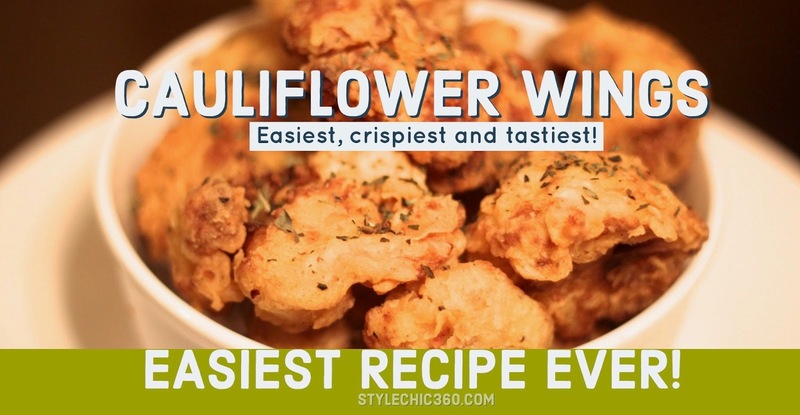 Honestly, this recipe is almost too easy, so I'm hoping that because it is so easy, you'll run right out to your neighborhood grocery store and pick up the ingredients, cook this up and be on your way to making and enjoying the easiest, crispiest and tastiest cauliflower wings ever! Since becoming vegan I've had so much fun experimenting with food. Cauliflower wings had been in my mental rolodex to make, ever since I ran across a number of YouTube recipe videos. For me though, most of the tutorials I saw were simply "doing too much". I did not want to use an egg replacer or flax seed egg. Most recipes called for baking and honestly, I just wanted a quick easy and simple recipe that wouldn't complicate my already hectic life. So I thought about it for a while and quickly remembered a recipe my Mom would make when I was a kid. My mom would make the crispiest chicken and all she did was coat the chicken with a wet and dry mixture. My Mom's secret weapon was a mixture of water, seasonings and flour. That's it! So that's what I'd do, too! I eyeball seasonings and encourage you to do the same, haha! If you're anything like me you'll probably opt to use the pre-cut florets, I mean who has time to chop up cauliflower? If you do, go ahead and cut your cauliflower into large chunks. Don't make them too small, or they'll look like popcorn chicken. Set aside and lets prepare the dry and wet mixture. Once you've gathered your ingredients you'll want to have two large bowls with lids to toss the cauliflower in each mixture. In one of your bowls mix approximately 1 1/2 cups flour and all of your seasonings. pop the lid on and toss for a great mix. In the other bowl add 1 1/2 cups of flour, more seasonings and a couple drops of hotsauce (hotsuace is totally optional tho, but make sure you add the seasoning!!). Add a cup of water (give or take). Stir it and mix everything well. Leaving no clumps. The goal here is to have a pancake batter like consistency, actually the runnier the better, that will make for crispier batter. Pop on your lids and get ta shaking, lol! in Martin voice! Ha! At this point you can go ahead and heat your oil. 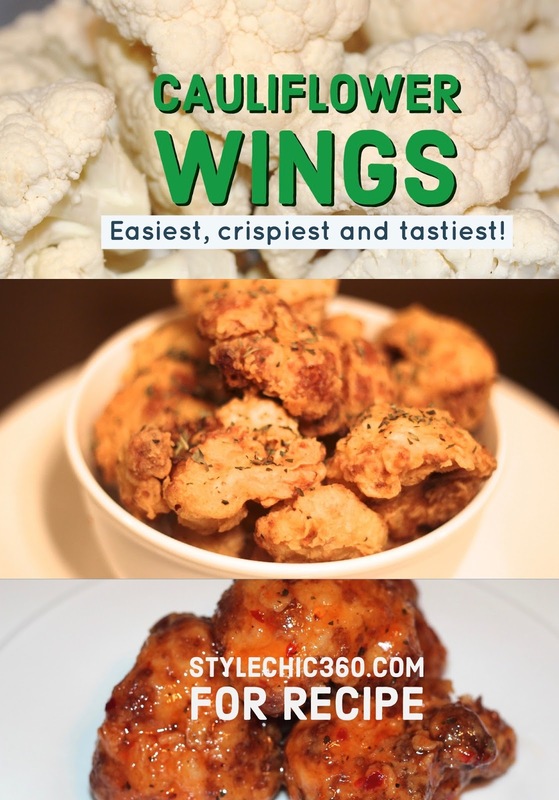 The trick for crispy non soggy cauliflower wings is HOT oil! Make sure your oil is hot enough so that your wings will cook fast. If you leave them in too long or if your oil is not hot enough, the cauliflower will turn into mash. Do it my way and you'll end up with something like this. Don't forget to drain them, garnish with your favorite herb and serve immediately. They're yummiest when they're hot! Feel free to get fancy and toss them in some sweet and sour sauce or even buffalo sauce like I did here. I wouldn't bake them with the sauce though, it makes them soggy. I'm hoping you'll love these as much as I do. If you make them, please share a photo with the hashtag #InezTaughtMe. Thank me later!! Enjoy!